Jooyoung Shin is an Assistant Professor in the Department of Fiber Science and Apparel Design at Cornell University. Opinions in this piece belong to the author. Last October, South Korea unveiled its team uniforms for PyeongChang 2018. Athletes were to be provided with a whole wardrobe, including a white padded jacket for the opening and closing ceremonies, tracksuits for training and public activities, and a uniform for medal ceremonies featuring colors from the South's national flag.The designs were well received by a nation excited about hosting its first Winter Olympics. Vogue Korea even photographed the athletes in their official gear for its December issue. Reviewing the outfits, emeritus professor of clothing and textiles at Seoul National University, Minja Kim, celebrated the use of national motifs. "Our uniforms feature … the colors and lines of the 'taegeuk' symbol from the national flag — white, red, blue and black. And the "Team Korea" calligraphy (represents) our national identity," she said in a phone interview, pointing out another hidden feature of the white jacket: a lining printed with the lyrics of the South Korean national anthem. But the excitement had barely settled when news broke that the two Koreas are forming a joint women's ice hockey team for the Games. 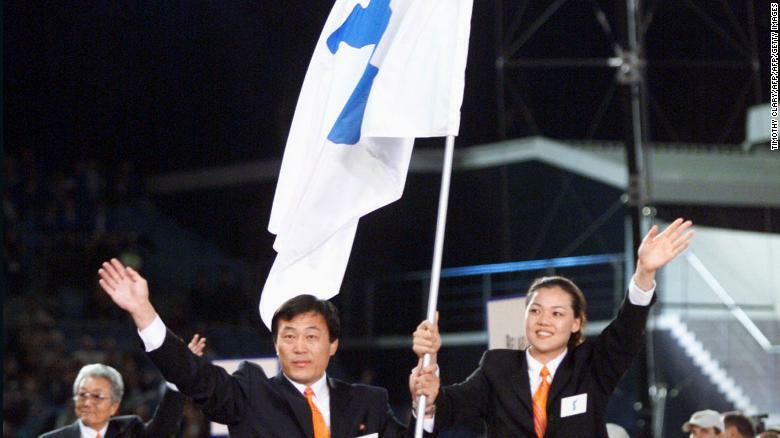 And in addition to marching together at the opening ceremony under the white-and-blue Korean Unification Flag, the athletes will need to wear new, shared uniforms. Given the current political climate, the formation of a Korean team might have signaled a welcome improvement in relations. But the decision has proven divisive in the South. Survey data shows that, although most South Koreans support the North's participation in the Games, more than half oppose the joint hockey team. The shared flag and uniform have also become sources of controversy — and not for the first time. In fact, the 2018 Winter Olympics will mark the 10th international sports competition since 1991 in which the two Koreas march together (and the fourth Olympic Games). On all of these occasions, athletes of both nations wore the same outfits. But they have always been supplied by the South. The team's parade uniforms for the 2000 Sydney Olympics incorporated orange, which has no known symbolic association for either country. Then, at the 2004 Olympics in Athens, the team's gear used traditional motifs called "saekdong" (the multi-colored stripes used in Korean children's clothing centuries before the peninsula was divided). But the designs were still largely based on the colors of South Korea's national flag, which uses black and a greater proportion of white (with less red) than North Korea's. This continued at the 2006 Turin Winter Games, where athletes wore white padded jackets with hints of red and blue (and a black-and-white striped scarf). So while these Olympic uniforms all bore the unification flag a symbol that Korea is as one — they have always been designed on the South's terms. There are only two other examples of "united" teams in the history of Olympics: East and West Germany, and the former Soviet Union. Athletes of the latter, a team comprised of former Soviet republics, wore a single style of uniform at both the Summer and Winter Olympics in 1992. At Albertville, male athletes wore gray coats with homburg hats and gray scarves, while female athletes sported salmon pink coats with pageboy hats. With the design process conducted in secret, the uniforms offered the world no visual signals of the states' individual identities. Instead, the silhouettes of their coats reflected the contemporary fashion style — wide-shouldered power dressing. At the games in 1960 and 1964, the United Team of Germany adopted a flag that incorporated the Olympic rings (while using Beethoven's "Ode to Joy" as an anthem). But again, there are few sources documenting the compromise made when designing the team's outfits. So while there are some precedents, the designers of Korea's new uniform must look to the countries' own unique circumstances. This process raises difficult questions. Undoubtedly, the North Korean delegation would refuse to wear any outfit embedded with the South's most recognizable national symbols — and vice versa. Many of the features unveiled by the South last October, such as the national anthem print and calligraphy-inspired logo, will have to be removed. Moreover, due to the tight deadline, the uniforms' structure — devised for optimal sporting performance — may need to be modified to accommodate these changes. Although an announcement regarding the final designs has yet to be made, the women's hockey team made its first joint appearance earlier this week. The jerseys bear the light blue Korean Peninsula motif. Seemingly small design decisions like this can carry significance on a global stage. Olympic opening ceremonies have become visual and narrative feasts of patriotic pride, with the Parade of Nations transforming stadia into dramatic runways to display, promote and advertise national identities. Ceremonial parade uniforms have been part of this sporting ritual since the 1912 Olympics in Stockholm. As well as visually communicating national identity, they symbolize cultural attributes and political or economic ideals. My own research into more than 600 different parade uniforms shows that the most common motifs are colors and symbols from national flags. Team USA Olympians, for example, are always clad in red, blue and white. Colors from the Olympic rings also make regular appearances, as do other symbols commonly associated with a country's identity. New Zealand's outfits, for instance, featured the country's native silver fern — known as "ponga" — for three consecutive summer games from 2004 to 2012. Parade uniforms may affect the psychology of athletes. Pierre de Coubertin, the founder of the International Olympic Committee, recognized the importance of national attire in helping athletes develop and focus their mental readiness for competition. For individual wearers, the parade uniform indicates their identity and role as a member of a national team. It can also enhance a sense of unification among athletes. Uniforms are important visual media which separate people of one nation from others (dissimilarity), while connecting those who belong to the same nation (similarity) through a process of identification, communication and unification. So, looking ahead to the Koreas' joint uniform, it is understandable that many in the South are skeptical of how it will represent their national identity. Symbols are an essential part of constructing the image of a nation, which, in turn, shapes the perceptions of wearers and spectators alike. But a design borne of compromise may carry little significance for athletes from either side, who were born and raised in a divided Korea. Imposing an alternative identity may weaken participants' sense of national pride, damaging their sense of motivation and even performance. Of course, national identity is being undermined to serve a new purpose: symbolizing unification and reconciliation efforts. It could be argued that the team's new identity represents an Olympic spirit that promotes peace and unity. But dressing athletes in a joint uniform may be only that — dressing, rather than inspiring a true sense of solidarity between two sides who, politically, economically and ideologically, share so little in common. When the athletes march into the stadium today, the joint team will undoubtedly be welcomed and cheered on by the world. It will be celebrated for its symbolic, emotional and political significance — an embodiment of Olympic values. Nonetheless, the question remains: What real purpose does a parade uniform, a shared flag and a forced national identity serve? Are they just superficial responses to serious political issues and North Korea's ongoing threats of war? The joint uniform conveys nothing but a simplistic message that Korea is one. But South and North Korea are two sovereign nations who were established on different ideologies and now share few cultural attributes. Rather than repeating a gesture that has, over multiple Olympics, failed to bring significant improvement to relations, the two countries should work toward constructing a meaningful shared identity that can resonate in the hearts and minds of all Koreans. Until then, the teams should wear separate outfits and march as two independent nations. A compromised identity serves no purpose for either side.